Commercial Plumber, Lakeland, FL | A Step Above Plumbing Inc. Commercial Plumber, Lakeland, FL | A Step Above Plumbing Inc.
Our expert commercial plumbers are able to handle any commercial plumbing job you may encounter in Lakeland. When you are looking for a commercial plumber to come in and fix plumbing issues that you may be experiencing in your business, you need a company that will do the job properly the first time. You also need a commercial plumber you can rely on to provide you with the highest quality of workmanship and products. This attention to quality along with a commitment to customer service means that we will arrive on time, ready with everything necessary to take care of your commercial plumbing system. Commercial plumbing systems are designed to handle larger volumes of water. This is due to the fact that, as a commercial business, you probably see a greater number of people come through your doors on a daily basis than most homes. When you multiply the number of people using your toilets, sinks and drinking fountains by the amount of water each fixture uses, the total volume of water used becomes exponential. At A Step Above Plumbing Inc., we have some great news for you. Our expert commercial plumbers are able to handle any commercial plumbing job you may encounter. We can take care of leaky faucets, faulty water heaters, clogged toilets, and anything else you can imagine. If you are worried about the age of your plumbing system, we can even take a look at it, determine how well it is working and suggest a relative timeline of when it will need replacement. If your plumbing system requires replacement, we are also able to assist you with this task. 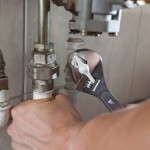 Contact us when you need a commercial plumber in Lakeland. Whether your plumbing system is struggling due to the amount of use it is getting or items being accidentally flushed down the toilet, our plumbing repairs will leave you fully satisfied.